We invite our readers to share their views and suggestions for publication on how to clean up the N-Choe which was once a pride of the City Beautiful. the Editor-in-Chief at along with your contact address and phone number. The Chandigarh Municipal Corporation, the Greater Mohali Area Development Authority (GMADA), the Punjab Water Supply and the Sanitation Department have initiated a clean-up action plan for the N-Choe, following an ongoing series of news reports on its stink in the Chandigarh Tribune. Muncipal Corporation Chief Engineer S.S.Bidda said the Corporation had earlier identified at least 52 points of sewage leak in different parts of the city which have been plugged during the past couple of years. A senior officer, requesting anonymity, said “We cannot claim to have 100 per success. However, the matter is being handled as a top priority.” Officially, the points where leakages have been plugged included the ‘Dhobi Ghat’, Sector 15, Hotel Shivalik View, Sector 17 and the Yatri Niwas, Sector 24. In the past, sewage flow into the choe was stopped for a while each time the issue was highlighted at different forums. In conversation with the Tribune, Bidda replied to the problem of leakage in the sewage occuring at key places. “We are hiring a Technical Expert Committee to help us decide the best option. We are working on different options available for finding a permanent solution to the problem of the sick ‘choe’. One of them could be a separate Sewage Treatment Plant, near the village. The project should cost approximately Rs 1. 5 crores”. “The second option could be installing pump sets to lift the sewage into special pipes, along both the banks of the choe, which could then carry the waste to treatment plant. This could cost approximately Rs 30-40 lakhs ”. Missing link: MC officers, in high level inter-state meetings, have pointed out that it was difficult to prevent all UT sewage from flowing into Mohali from different points, particularly Kajheri. Secondly, since the local population is a big vote bank during different elections, politicians do not allow the “poor to be inconvenienced”. Much also depends on how fast the UT decides on the option it would exercise for clearing the muck. Missing link: A “small trickle” cannot constitute a stream with a pool of water a little ahead of the residential area which continues till the end of the choe in the UT. The area is also thickly populated. Message: Let’s hope for a quick plugging of a leakage spelling misery. What it means: The Municipal Corporation needs to be at the job of not allowing sewage flow into the ‘choe’ tract”, throughout the year. Missing link: How could the Kajheri mess be cleared, at such a short notice, without a new Sewage Treatment Plant or by pumping it into the sewage pipe. During the last joint inspection of the N choe carried out with UT officials, pointed out at least eight points in the UT and three major points of sewage leakage in Mohali. “ Despite efforts by the UT officials, sewage is still flowing into Mohali. In Mohali, the Sanitation Department had been asked to plug sewage flowing in to the Choe from residential areas of Sectors 63, 64, 65 and 67. Besides, around 10 mgd of sewage being generated from Mohali and presently being discharged into the Choe by GMADA near Sector 68, is being plugged as the sewage treatment plant and the related infrastructure built at cost of around Rs 35 crores is scheduled to become operational by May 31, 2010. “ UT is responsible for the sewage flowing from its Sector 61 and adjoining areas in to the Leisure Valley, here”. Missing link: GMADA officials say that UT had punctured its storm water network near Phase 7 and was discharging its sewage into it. No one has any idea about the sewage flowing in to the choe near Burail Jail and the Group housing Societies in sector 51. Missing link: Sewage still trickles in to the choe through points near the PCA and Sports Complex in Sector 63. Official;s have no idea about the points. Missing link: There is need to regularly clean the choe bed. How pristine was my rivulet! When I first came to Chandigarh in the 1960s as a young lad, the Leisure Valley and Rose Garden were our regular haunts. More bewitching than the greenery was the beautiful N-choe running through them. The water was crystal clear. I distinctly remember that, because I had jumped into it several times, "accidentally". Who was to know that I would live to see it turn into a virtual sewerage? Many a time, we floated paper boats in the sparkling water. Since it was slow moving, it was fun to walk along the banks, splashing water on each other. At many places it was so wide that it was not possible to jump across. That was enough to put our young minds into fantasy mode. Why not make the rivulet bed a little deeper and ply boats in it? What fun it would be to start a joyride near the Punjab and Haryana High Court and go on past Sector 23. Mind you, southern sectors were hardly existent then. Like all "harebrained" ideas, this immature suggestion was rejected out of hands by our elders. "Have you not seen that there is very little space when the rivulet passes under the bridges?" we were told. So what? The culverts can be made bigger so that at least small boats can pass underneath, we insisted, hoping to have our own little Venice in the backyard. No luck. The water in those times was abundant during the rainy season and sufficient even in other months. Perhaps the excess water of some tubewells was discharged into the rivulet. Soon, water started becoming scarce and almost vanished a few years later. People would now walk across the rivulet. With the passage of time, the bed started getting shallower and shallower, with the result that soon the choe was as good as gone. With these natural passages to drain out water during the rains abandoned, Chandigarh is perennially prone to flooding during the monsoon. But the worst was yet to come. Soon, the rivulet became a convenient way to dispose of muck and stinking water. Things became worse as one moved downstream. People protested and the administration did what it does best: ignore the public entreaties. Now that the issue has been highlighted by The Tribune, there is some semblance of action. How long it will last is the major question. One hopes for the sake of City Beautiful -- which we have come to love -- that the clean-up drive will be more successful than the Ganga Action Plan. A newspaper can only highlight the problem. The buck, as they say, stops at the desk of the administration. So does the muck. It is another matter that when any such harsh reality is pointed out, even people of the stature of West Bengal CM Buddhadeb Bhattacharjee duck the real issue by telling Home Minister P Chidambaram to "mind your language". While we hapless citizens, who also double up as newsmen, look into dictionaries to find more acceptable ways of saying that the government must not pass the buck, perhaps the officials can get down to the task of cleaning up the mess, for a change? A Mohali resident allegedly stabbed his daughter’s mother-in-law to death at her Sector 55 home here late last night. The police arrested the suspect, identified as Ved Parkash Kalra, from the scene, claiming the latter had told them his daughter was being harassed by her husband’s family members. According to the police, the incident occurred at about 11:30 pm when Kalra, a resident of Phase II in Mohali, was alleged to have repeatedly stabbed the 50-year-old victim, identified as Nirmala Babbar, following an altercation. He was reportedly under the influence of liquor at that time and had brought the knife with him. Nirmala’s son, Ravi Babbar, who sells diamonds and had just returned home at that time, was also injured in an attempt to save his mother. Ravi said his severely wounded mother lay on the floor bleeding profusely while he grappled with his father-in-law who in turn was attempting to strangle him. “He pushed me against the wall and my mother was crying and writhing in pain and repeatedly pleading ‘save me Raju’ (his nickname). I tried calling up the police but my mobile phone fell and he (father-in-law) kicked it away from me, breaking it instantly”, Ravi told The Tribune at the Government Multispecialty Hospital (GMSH), Sector 16, where a postmortem of his mother’s body was being conducted. Ravi added though he cried for help yet nobody from his neighbourhood came to their help. People residing in the vicinity assembled only later and then called up the cops. “Had our neighbours reacted in time my mother’s life could have been saved”, he lamented. He said he too eventually managed to call up the Sector 39 police station. The police rushed the victim to GMSH where she was declared dead at about 1:30 am. Narrating the events leading up to his mother’s murder, Ravi said he had married his wife, Amrita Babbar, four years ago. They lived with their three-year old son and his mother. His wife had gone to her parent’s home on April 4 following a quarrel between them. The police said Amrita is a graduate while Ravi had only completed high school, which might be a possible cause behind their souring relationship. “I told my mother yesterday I had got my son admitted in a school and she should return home, but she refused. I arrived home at about 11:15 pm and found my father-in-law there. He was talking to my mother and I went to my room. He followed me there and asked me what had happened between my wife and me. I told him to ask his daughter”, Ravi said. “Just then my mother entered the room and advised me my wife and I should resolve matters and live peacefully. Kalra, who was talking to me, then pulled out a knife and began stabbing my mother in her belly, waist and on the arms”, added Ravi, whose right hand was injured in the scuffle that followed. After committing the crime Ravi said Kalra sat on the bed resting his head on his knees. “He then folded his hands and began apologizing”, he added. Neighbours said the couple had a strained relationship and frequently quarreled with each other. Kalra has told the police Ravi and his family had been harassing his daughter and that he had gone to their home to discuss the matter. He refused to say anything about the alleged murder. The victim’s brother, Shanti Saroop Verma, a resident of Gurdaspur, said his sister had came to him along with her grandson and stayed with them for three weeks. Amrita came and brought her mother-in-law back with her to Chandigarh. “It appears it was a planned murder”, he said. Nirmala’s husband had died 15 years ago. Sector 39 police station SHO inspector Janak Rana said the suspect had brought a 10-inch long dagger with him, which was recovered from the house. He was produced before a local court that remanded him to judicial custody. A case of murder has been registered and the body was handed over to the family members after the postmortem. The Engineering Department, Chandigarh Administration, has started the silt-removal process from the bed of Sukhna Lake with effect from first week of April in an attempt to revive the lake to its pristine glory. To study and evaluate various impacts of soil and moisture conservation works on the ground water, soil, geology and vegetation in the catchment area of the Sukhna Lake, a study was commissioned by the Department of Environment in 2007-2008. The study was conducted by the Society for Promotion and Conservation of Environment (SPACE). The expert group has submitted its report to the Forest Department. As per the report, titled ‘Study on Impact of Soil Conservation Measures in the Catchment of Sukhna Lake on Ground Water Soil and Geology’ the siltation rate is reduced from 150 tonne per hectare per year to less than 5 tonne per hectare per year. The tree stocking density has improved, rise in water table and other positive geomorphic changes have also been noticed. The Engineering Department, Chandigarh Administration, intends to remove about 5,000 lakh cft (cubic feet) of silt from the lake bed during this financial year. About 35,000 cft of silt has already been removed since April 2. In Phase l i.e. from April 2 to April 30, desilting work will be carried on from 6 am to 12 noon and from 3 pm to 6 pm, in which 5.00 lakh cft of silt will be removed; whereas, between May 1 to May 31, 10.00 lakh cft of silt and from June 1 till the advent of rainy season, 15.00 lakh cft of silt will be removed. In Phase II, beginning from September 1 to December 15, 2010, from 7 am to 12 noon and 2 pm to 5 pm, work will be undertaken to remove 10.00 lakh cft silt. In February and March 2011, desilting will take place from 6 am to 12 noon and 3 pm to 6 pm and 10.00 lakh cft of silt will be removed. Help has also been sought from the Punjab and Haryana governments, the BBMB and Army authorities so that men and machinery would help accelerate the work and the target of 50 lakh cubic feet of silt removal from the lakebed would be achieved. The Sukhna Lake was built in 1958 across Sukhna Choe and was conceived as a place of relaxation, seclusion and sport. The lake spreads on the foothills of the Shivalik mountain range and is a major tourist attraction. The total catchment area of the Sukna Lake is 4,207 hectare. The soil in the catchment area is sandy, embedded with pockets of clay, which is highly susceptible to erosion by surface run-off water especially in the rainy season. The flow in the seasonal streams is turbulent and exposed hill slopes result in massive soil erosion. All these reasons have led to heavy siltation of the Sukhna Lake from 1958 to 1988. The Sukhna Lake was being looked after by the Punjab Irrigation Department from 1958 to 1979 and was subsequently transferred to UT Chandigarh. In the first case of its kind in recent years before the district courts here, two married couples - Kaithal-based Bharat Bhushan and Sonia Saini and city-based Hardeep Singh and Rishu Gupta sought police protection fearing persecution from their families against whose wishes both couples had married. Coincidently, both couples married on the same date, April 5, in Chandigarh. District and Sessions Judge SK Goel today directed the Chandigarh SP to provide security to the couples, who had married against the wishes of their parents. He also summoned the family members of the couples on April 20. The directive follows recently issued orders by the Punjab and Haryana High Court asking the District And Sessions Judges in the two states and Chandigarh to pass necessary orders on their plea for protection. Both couples submitted to the court that they had married each other against their parent’s wishes. Bharat and Sonia told the court that they belonged to Kaithal district and had got married on April 5 this year against the wishes of their families. They had been threatened by their family members and thus should be provided security, they pleaded. The other couple, Hardeep and Rishu, said they both belonged to different castes and that their family members were against their courtship. They alleged that their parents were threatening to disrupt their marriage and also feared for their lives. The District and Sessions Judge passed orders for their protection. “Without commenting upon the merits of the case, a notice must be issued to respondents and in the meantime a direction is issued that if the applicants approach any of the respondents then their request or grievances as mentioned in the petition shall be considered and looked into by them in accordance with law,” the order read. A decision by Punjab local government department principal secretary C. Roul on the case of alleged misuse of power by municipal council president Rajinder Singh Rana was again deferred indefinitely today. Rana had received a letter from the principal secretary’s office yesterday in which he was asked to present himself at the office at 12 noon today in connection with the case. He arrived there at the appointed time but Raoul was not in his office. According to Rana, the principal secretary, who had gone to meet the Punjab chief minister, returned at about 1:15 p.m. and told him (Rana) that he would be called again to the office in connection with the case. No date was, however, fixed for the next meeting. The case had come up for hearing once again on March 11 after an interval of over two years and Rana described the move as “politically motivated”. The Congress party-backed civic body chief was issued a show cause notice on June 11, 2007, by then local government principal secretary DS Bains on charges of misuse of power. This followed after a report by JS Thind, the municipal council executive officer at the time, was sent to senior government officials. The report alleged Rana had transferred three employees without having the powers to do so. Thind had also accused Rana of continually postponing opening of sanitation tenders, which he said had adversely affected the civic body’s work. He had recommended action should be taken against the MC chief in this regard. Rana, however, had said he had not misused his powers and had transferred the employees from one seat to another within the council, asserting he had the powers to do so. He claimed he had postponed the tenders only to bring about changes in the terms of the agreement to “introduce more competition” among the contractors. Rana stated Bains had heard his arguments and those of the executive officer in October, 2007, after which a decision on the matter was kept reserved and nothing happened later. The city today experienced the highest temperature of the season with the maximum recorded at 38 degrees Celsius. In contrast the minimum temperature was almost 20 degrees less at 18.6 degrees against 17.6 degrees recorded yesterday. Going by the pace at which the mercury is soaring, the metereological department predicts the probability of the maximum temperature soon breaking the all-time record of 38.4 degrees C on April 7, 2004. Last month the city recorded the highest temperature for March since 1971 at 37.1 degrees on March 25. Met officials say there is no respite in store for residents in the coming days. The mercury has been constantly on the rise since the beginning of this month with hot afternoon winds blowing continuously for many days now. The weatherman sees a further rise in the temperature in the days ahead. The maximum and minimum temperatures on Friday are predicted to touch a maximum of 39 and a minimum of 21 degrees C. The Met has forecast a partly cloudy sky during the next 24 hours in the region. 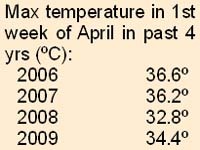 Between 2006 and 2009 the daytime temperatures in the first week of April have ranged between 32.8 and 36 2 degrees C. The night temperature on Wednesday was reported to be 17.6 degrees C, four degrees above normal. According to the Met department, the maximum and minimum humidity levels were pegged at 51 per cent and nine per cent, respectively, which in turn were responsible for the dry weather. Regional Met director Surinder Paul said the reason behind the rise in temperatures was less rainfall in the northern region and the resultant flow of dry and hot westerly winds. More than 12 infants from various slum colonies of Mauli Jagran, Ram Darbar, Sector 26 and Saketri were admitted to the Government Multi Speciality Hospital (GMSH) tonight with suspected gastroenteritis. The infants were brought to the hospital around 10 pm with complaints of vomiting, loose motions and stomach ache. What added to the anxiety of the parents of these infants was the alleged absence of the paediatrician, who was not on her seat for almost one hour. A resident of Sector 26, Shammi, whose two children were admitted to the hospital, alleged that the doctor was not there for almost one-and-half hours. “We reached here at 10 pm and till 11 pm no one was there to attend to these children,” he said. The paediatrician on duty, Dr Jagriti, said the children were suffering from gastroenteritis. She said the sudden change in the weather was the reason behind the early outbreak of gastroenteritis. Vice-President of India M Hamid Ansari, who is also the Chancellor of Panjab University, will visit the university tomorrow to attend and address the memorial function of Dr VN Tiwari, who was a member of the Rajya Sabha and a professor of Punjabi (Bhai Veer Singh Chair). He was assassinated by terrorists during the Punjab militancy in mid-1980s. The function will also be attended by Punjab Governor and UT Administrator Shivraj Patil, Union Minister for Parliamentary Affairs and Water Resources Pawan Kumar Bansal and Haryana Chief Minister Bhupinder Singh Hooda. While university officials will try to put their best foot forward, both Panjab University Teachers Association (PUTA) and Panjab University Campus Student Council (PUCSC) are expected to raise several pending issues. The Panjab University Teachers Association plans to discuss the long-pending demand of central status for the university. “It’s not just the fund which we are bothered about but the status of the university. If he feels that we are making a mark as an educational institution, we should be awarded the central status. We have been dodged on the issue for a long time now and will thus urge the Chancellor to help us in securing the status,” said Manjit Singh, president, PUTA. According to an unofficial survey carried out by PUTA, the university is still struggling with a deficit of over 55 per cent of the required teaching staff. Claiming that the current policies are lop-sided, PUTA plans to bring the issue up with the Chancellor and urge him to direct the university officials to treat staff crunch as a priority over the ongoing beautification plans. “The university has come out with many courses, which neither have enough infrastructure nor faculty. We have taken up this issue up with the VC many times, but nothing has happened. Now we will let the Chancellor know the true state of affairs,” said PUTA president Manjit Singh. The Panjab University Student Council plans to highlight the difference between the true student needs and the university policies. Among the issues to be taken would be poor infrastructure of newly launched departments, long-awaited renovation of the old departments, ailing hostel infrastructure, virtually non-existent placement cell and the pending teacher evaluation programme. A centre superintendent today resigned from his post, citing “malpractices” in the Panjab University’s examination system as the reason for his resignation. In a letter addressed to the Panjab University’s examination controller, centre superintendent of the Dev Samaj College for Women at Ferozepur, Dinesh Sharma, listed irregularities that were rampant at the examination centre. “When I joined, the college principal told me not to make any unfair means case (UMC) against any student while supervising the examination and if it was urgent, the principal should be consulted before taking any steps. A few cases were reported on the first day of the examination, but I was not allowed to take any steps and was also asked to allow students to copy a bit,” he stated in his letter. He further alleged that that the examination centre clerk had deliberately made a wrong seating plan and when objected, the college authorities, including the principal, stood by the clerk and threatened Dinesh with dire consequences for his “non-cooperation”. He was told that the principal was a member of the Syndicate. Sharma said he had also brought out the anomalies in the allotment of mergers. “I prefer to quit rather than work in a system where everyone bends rules,” he stated in his letter. Meanwhile, Vice-Chancellor RC Sobti and examination controller were not available for comments. Appreciating the building design of the Beant Singh Memorial and the Chandigarh Centre for the Performing and Visual Arts today on his first visit to memorial Punjab Governor and UT administrator Shivraj V Patil asked the officials concerned to complete the construction work of the building in the first phase and gardens and beautification of the lake in the second phase. Patil said library should be on modern lines in all respects. He also told them to replace ceiling fans with air-conditioners to give a better look and to avoid the noise of fans in the library. He stressed upon constructing an auditorium where national and international conferences could be organised. Pradip Mehra, adviser to administrator, MP Singh, secretary to Governor, Ram Niwas, Home Secretary and Sanjay Kumar, finance secretary were all present. Pankaj Kumar, a first year student of Institute of Pharmacy Science, was admitted to the PGI after he reportedly took an overdose of some medicine. The police is yet to record his statement to ascertain the reason behind the incident. Sub-inspector, Sector 11 police station, said Pankaj’s roommates Akhil Bansal and Navdeep Singh told the police that the former was upset over his poor performance in examination. They told the police that Pankaj had called them outside the University Institute of Management Science last night. After failing to find Pankaj there, they went to his room and found him lying on the floor.